Junior Raghvi Bhatia 19 GL works on a piece incorporating pin oak, walnut and pine. 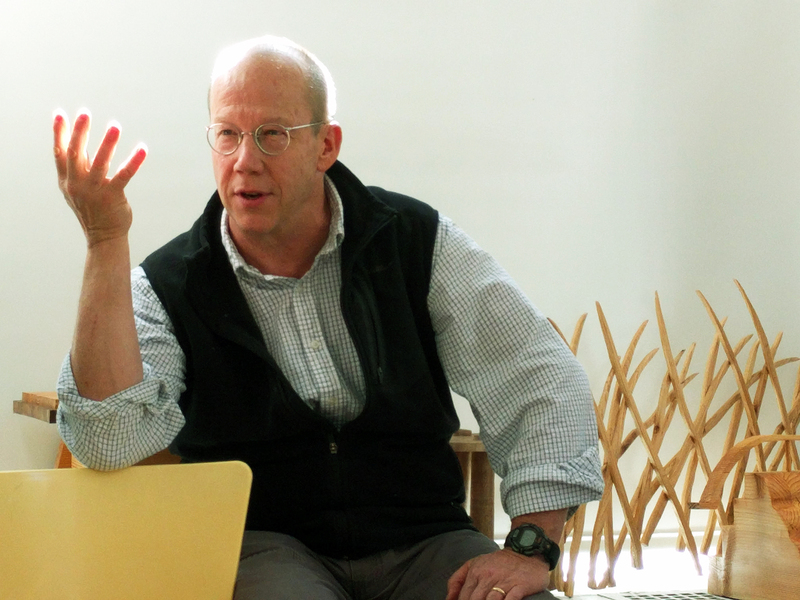 Now in its ninth year, RISD’s Witness Tree Project—a cross-disciplinary studio course in collaboration with the National Park Service (NPS)—continues to bring American history to life for students. 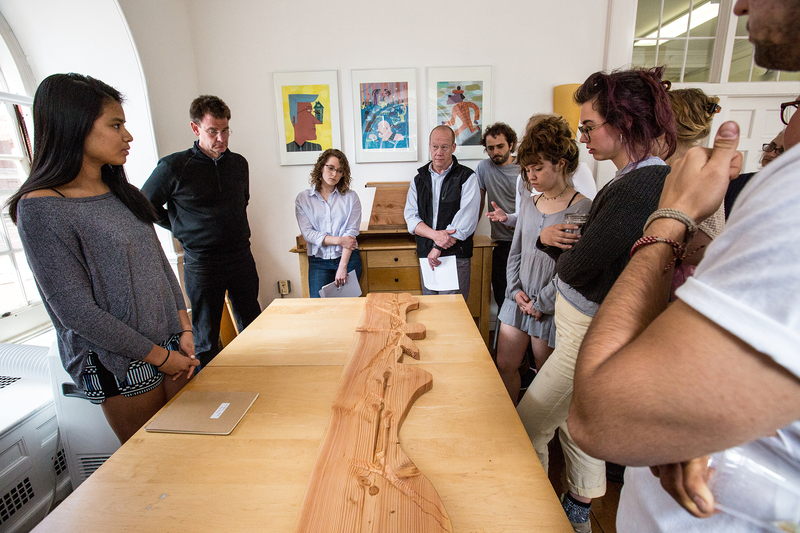 Taught by Associate Provost Dan Cavicchi and Senior Critic in Furniture Design Dale Broholm, the class combines studio making with deep research, presentations by visiting scholars and rigorous debate, challenging students to construct meaningful wooden objects that reflect on historical context. Unlike in the past, this year materials came not from a single 200 (or more)-year-old tree that has fallen, but from several different species of limb wood collected at Adams National Historical Park in Quincy, MA. The park encompasses the former estate of second US President John Adams, his wife Abigail and their son, the noted abolitionist and sixth US President John Quincy Adams. The class considers Dana Le’s bench top concealing a map of The Underground Railroad. The class focused on three aspects of the Adams’ story: founding father John’s concerns about the consolidation of power among wealthy elites; the role and rights of women in Colonial times; and John Quincy’s lifelong (and, of course, unsuccessful) attempts to abolish slavery in the US. Students researched these topics and related issues—such as the gag rule that kept Congress from even discussing abolition until 1844—and made objects commenting on each issue. Senior Odette Blaisdell 18 SC drew inspiration from a diagram Cavicchi shared representing patterns of forced migration among enslaved people from West Africa in the 17th and 18th centuries. At the final group critique on May 15, she presented a grid-like structure built of wood and treated with primer, glue and steel dust to resemble an iron grate. 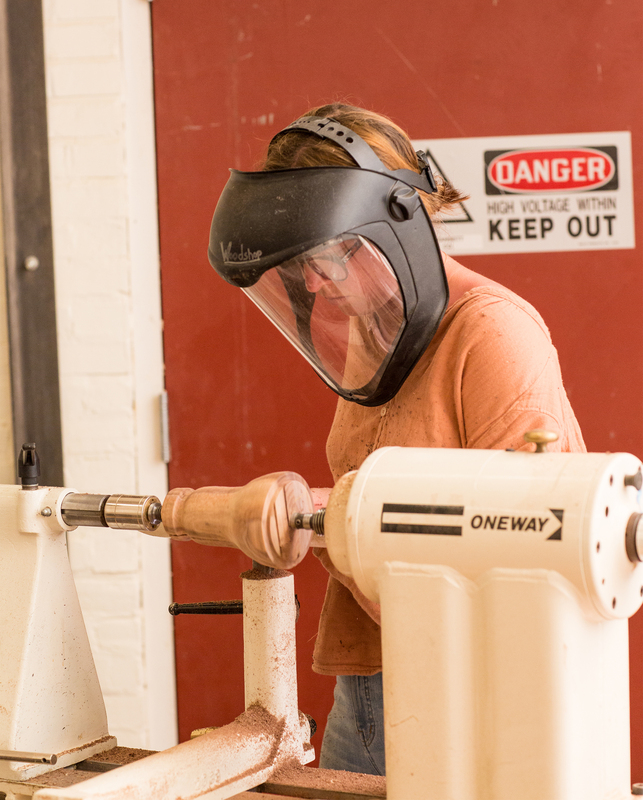 Brown student Kirby Engelman uses the lathe to shape her wooden bell. Dana Le, one of three Brown students enrolled in the class, approached her final project from the perspective of an enslaved person seeking freedom. She created a wooden bench with a top that hides a subtle map of The Underground Railroad, the network of individuals and safe havens for moving fugitive slaves north. “This is my first RISD class, and I’ve been able to apply a lot of what I’ve learned at Brown—especially research techniques—to these projects,” she says. As part of the final crit, the class debated the pros and cons of removing, replacing or reinterpreting Confederate monuments still standing in public spaces across the US. Visiting critic Caroline Kleinath, deputy superintendent at Adams National Historical Park, sees Le’s bench as an appropriate counterpoint to remaining Confederate monuments. Fellow Brown student Kirby Engelman brought the conversation even closer to home with her clapper-less bell. Carved in its wood are the numbers 1838 and 272. In 1838, she explains, Georgetown University sold 272 enslaved people to keep the institution financially viable. Nearly 200 years later, administrators are still debating how to make reparations to their descendants. The bell’s silence, she notes, mimics the silence of officials at Georgetown and many other East Coast colleges that haven’t yet grappled with historic realities like these. Junior Quincy Kuang 19 ID presents an absurdly disproportioned gavel reflecting on the gag rule. 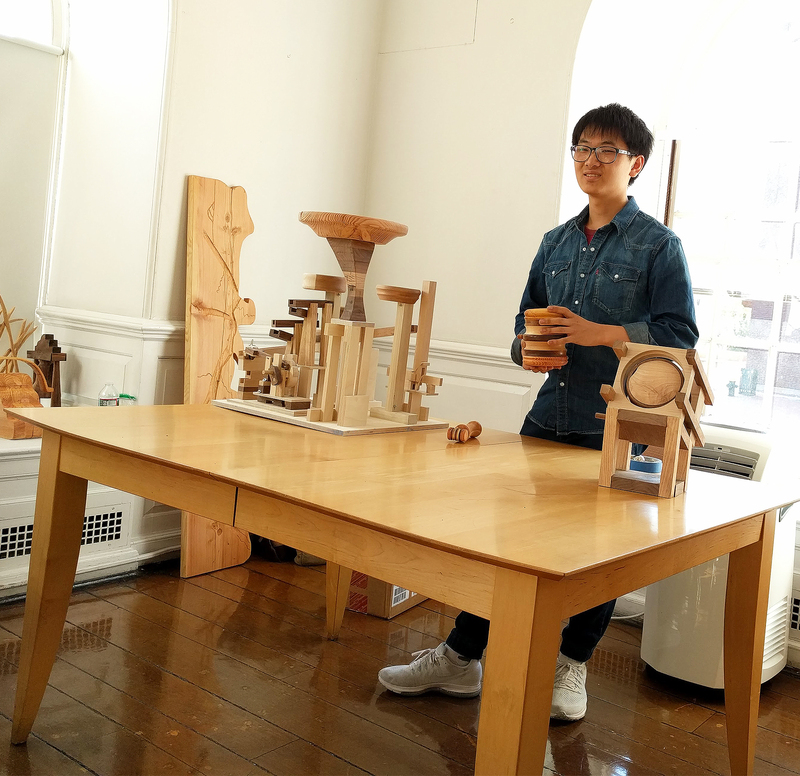 Students in this year’s Witness Tree Project studio reflect on immigration by creating objects from a fallen elm that stood in Brooklyn’s Prospect Park for 150 years. Twenty objects made by students as part of last spring&apos;s Witness Tree Project are on view through October 5 in an exhibition in New Jersey. 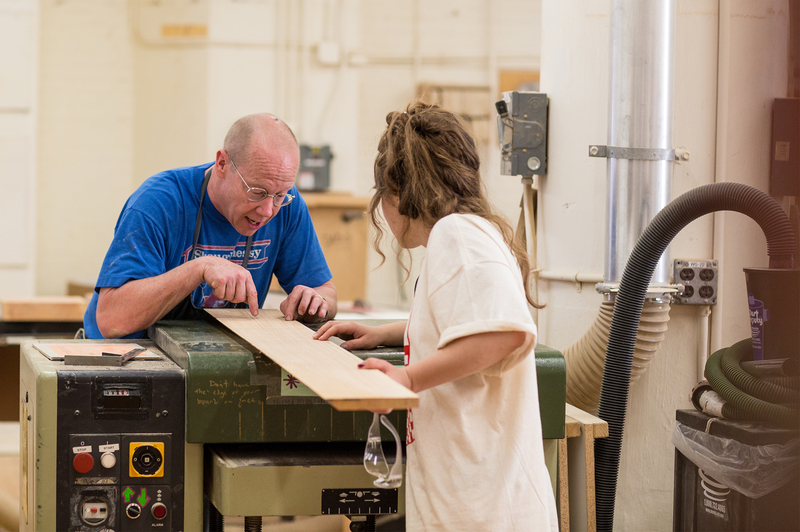 Work by students in this spring’s Witness Tree studio is being exhibited at the Martin Van Buren National Historic Site in New York state.